Greetings crafty friends. LeeAnn here to host the blog today. 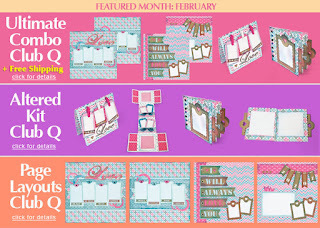 I have a project to share with you featuring pieces from the February Club Q kits. I had a lot of fun with this project mainly because I was making it as an anniversary gift. My daughter's 4th wedding anniversary is February 15, and this page is going to be for her and my son in law. For this project, I used pages from the Winter Bliss collection along with some white card stock that I chalked to make it the color I wanted. 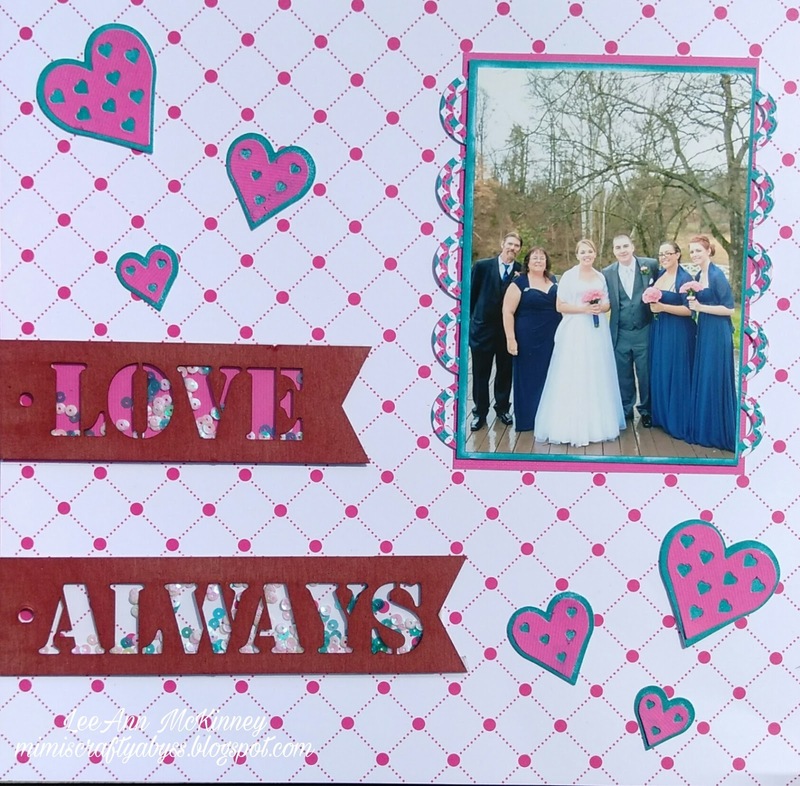 The main base is using 102, and I used a second sheet of the same for the hearts, photo mat and the under layering of the chipboard LOVE. Using white cardstock and a set of Sizzix dies I cut out 2 sets of each size heart and then the smaller size was cut from the Winter Bliss. The photo is a 4x6 size and I cut a base from the white card stock, and then slightly larger from the Winter Bliss. 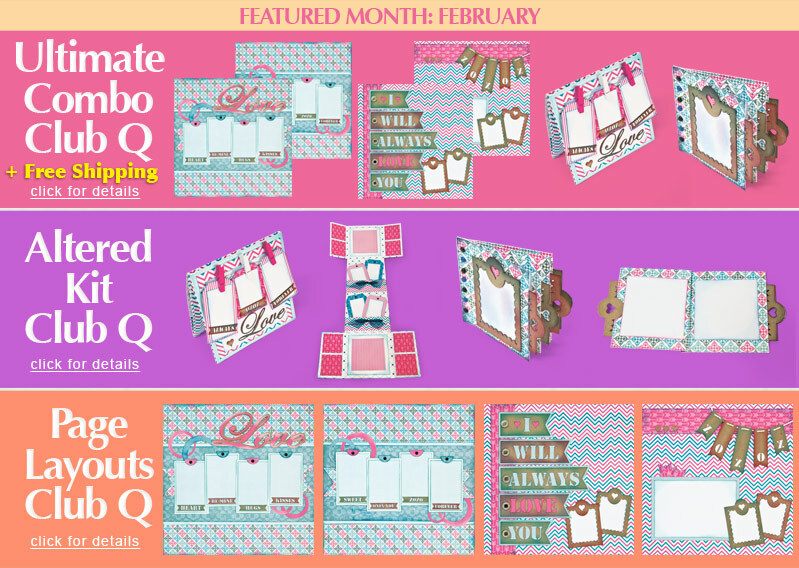 Using another Sizzix die and 101, I cut two coordinating borders. Once I had all my layers cut, I went to work with Baja Blue Powderpuff Chalk Ink which coordinates great with this paper. I chalked the larger heart layers and the smaller photo mat with the Baja Blue. After this was completed, I started adhering the items to the base. I think my favorite part of this project is the "Love Always" title. These chipboard pieces are part of the Club Q Kits, and after cutting down some clear acetate as an underlayer, I inked the pieces up using the Fuchsia PowderPuff Chalk Ink. I love how it adds just enough color to make me happy. I adhered the acetate to the chipboard, then some foam dimensional tape all the way around. After figuring out where I was going to put the pieces on my page, I dropped some sequins in those spaces, then placed down the pieces. So now we not only have a 12x12 page with cascading hearts, but we also have two shakers as well to add interesting elements to the page. I hope you all have enjoyed this trip down memory lane with me. Cute layout LeeAnn! Love the shaker title! This is awesome! Can't wait for my kit.